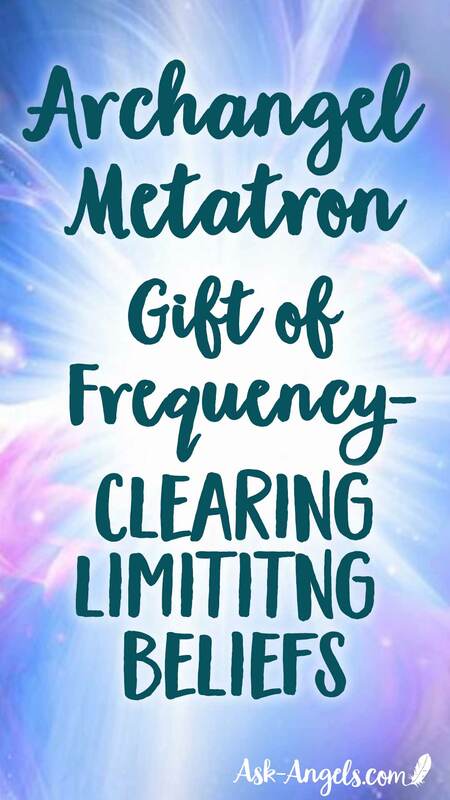 Archangel Metatron connects with a beautiful gift of frequency to support you in clearing limiting beliefs and aligning with your highest path of love in this free angel message. Clear limiting beliefs and raise your vibration to deeply attune to love now! You can also now access this message on YouTube or keep scrolling down to read the transcription. Greetings from Archangel Metatron. As always, it is an honor to be among you and to connect with you now. 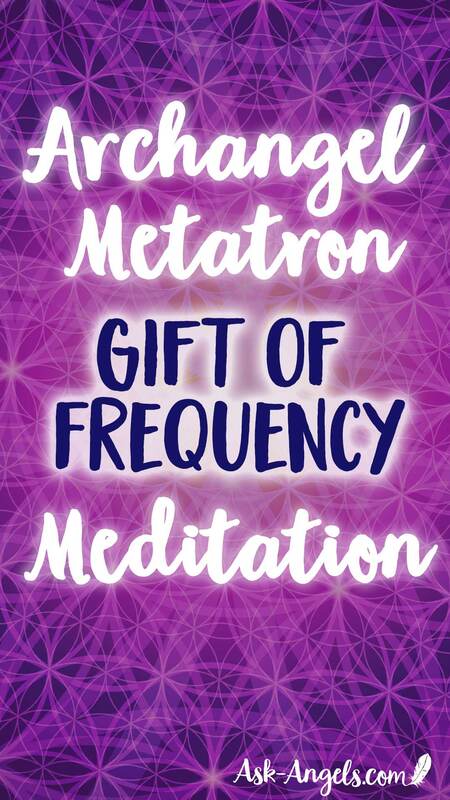 I greet you with the gift of frequency, which as you breathe in deeply, and allow your consciousness to drop from your mind and into your heart you are able to feel, sense and perceive. Open your heart, and now above your head… Notice a pyramid of white light. This is my energy reaching out to connect with you now. Allow this light to enter in through your crown chakra. Your crown chakra is one of your channeling chakras and directly links you to the Infinite and to the Divine. As you allow this connection, feel your energy rise. Through this connection with the light, allow all negativity you have absorbed throughout your day and throughout your week to be simply dissolved. For the light you are surrounded in now cannot exist in the same space as negativity. So we release negativity into the light. And feel yourself lift now. What do you feel like? Feel into your body, and around your body noticing you feel lighter. Centered. Calm. Remember to breathe now as you continue to receive light, and increase your vibration. Know that you are moving in the direction of embodying an elevated vibrational state of love. You are able to experience this love vibration always. So too know that you are not limited in any way. Any limitations which you have put on yourself, are simply that. They are your limiting beliefs and filters on your perception. So I urge you now to review your life in a gentle, loving way. Review the beliefs that are ingrained in your psyche, that are ingrained in your subconscious … The default beliefs that you do not even think about, but embrace unknowingly and possibly unwillingly. These are traits and characteristics which others believe you to have from your childhood. And that has been affirmed to you… that you lose your temper easily, or that you are shy, stubborn, or quick to judge. This is not who you really are. Let yourself take into account these beliefs and allow yourself now to simply observe them. And ask yourself: “Do the beliefs I am holding on to truly serve me in embodying my highest authenticity and most radiant light? You will find that for a large extent of what you believe about yourself, the answer is no. Becoming aware now that so too, emotions you are holding onto… Like guilt, grief, frustration, and self-judgment. These do not serve you… And also, you are not required to carry them. Feel into whatever emotion is clouding the full extent of your light. Feel into it… And now as you exhale, simply let it go. And now, allow yourself focus in on a limiting belief… Let it come into your awareness. Something that you have incorporated in your life and that you believe to be true at this moment, but that is limiting, disempowering, or that is simply untrue. This can be anything. It can be that you are lacking abundance, that money is hard to come by, that you’re unhappy, sad, or that you are cut off from receiving direct guidance from Spirit. Where are you limiting your highest potential with a deeply held belief that is simply not true? Feel into this belief. Focus on one, and it does not matter what. Allow the belief to be here with you now. Look at it objectively. Look at it from the place of the observer. Remove yourself one level from the belief. You are not the belief. It is simply something that you have incorporated, for you felt it served you well. But now that you look at this belief… and feel its energetic signature. For many of you, beliefs centered in lack, limitation, or negativity have greatly distorted your perception as to what is truly possible in your life. So let us together practice releasing. Focused on this belief here now… This belief that has been ingrained in your consciousness and in your life. To lift your vibration… To align you with love… To restore your direct and beautiful Divine connection. You are supported in releasing all beliefs that no longer serve you. All beliefs that keep you from your unlimited nature and this is your truth. And so together, we released one now, but know there are many. Many that have been repressed, that you may not even know you have, but that are causing you to create events, people, circumstances, feelings in your day to day life that are not in line with what you really want, with what you really came here to do, and with what your soul, your higher self, your divine being that sits among angels and guides now… chooses and wants. So know that you are supported in removing your limited belief system and patterns. And know that this is not necessarily an easy process, it takes radical awareness, acceptance, and a willingness to change. But committing to it now will change your life. And this is good. For each one of you has areas in which you can experience more joy, more abundance, and more love. You are fully capable of staying in these heightened vibrations, these euphoric feelings always, by simply replacing the beliefs that are limiting with beliefs of abundance and love and joy. We went over releasing. But now I will talk briefly about identifying beliefs that do not serve you. This is easy to do. It just takes being an active observer of your own life. Observe how you respond to situations and people. If an experience is challenging for you, if you find yourself getting frustrated, getting angry, upset, or sad by any situation, this is a trigger for you. One, that is revealing where your current thoughts are not in line with what you really want, and two, that there is a belief system around this that is no longer serving you. So when you find yourself feeling frustration, anger, sadness, or discontent… Do not be afraid of it. Do not push it away or try to pretend that it is not there. Rather, look at it. Observe it. And learn from it. There are huge lessons for you in all of these emotions. So actively observe your reality, your life, and know that doing this has so many benefits. For it also is going to assist you in disassociating from the negative and downer voice that is your ego. When the voice of negativity, your ego chimes in, take this same role as observer. Step back. Step in, meaning drop your consciousness from your mind into your heart and observe. Observe what your ego says, whether it is; “you're lousy, or you'll never get what you want. Or you're not good enough” Observe it. And then think to yourself, wow, that is my ego. But that is not me. Then drop deeper into your heart. Inward focus. This is your assignment for the week. Did you know there would be an assignment? Take time each day to turn off your mind, drop into your heart, and experience the stillness that is around you….. Experience the void. Quiet. For within this quiet, you are able to connect with your true self. Your true self is so beautiful and so pure. And has an important mission on Earth at this time. That's why you are here, that's why you are really here. You would not be here if you did not decide that you were ready and willing to serve. And what is this service? Well it is many different things. But it is centered around choosing love, and waking up. Shifting from experiencing illusions fully, from experiencing fear and emotions that are not enjoyable. And shifting to Heaven, bliss, enlightenment… stillness. You are ready to make this shift. You were quite literally born to make this shift. So as you take time each day to be quiet, to be still, and be calm, and to look within, your energy grows. You reconnect with your truth, with the truth of who you are. And with your true purpose in being here at this time. Know that you do live in a very exciting time. A time of ascension, and of global change. Change that is so big that it not only affects your entire race, your entire planet, and every creature and being on the planet, but it is also impacting the entire universe. The service that you provide during this shift is no small deed. But you are well equipped, and stepping into this flow of creation in the highest interest of all, well… It is a profound layer and reason for why you are here. So let yourself remain focused on how may I serve, not how may I getm or even what might I create, or anything like that. How may I best serve? And we tell you now, the answer to this, the answer to how may you serve, is look within and choose love. Love for yourself, love for others, and love for your planet. As you do this, everything changes. As you love, your next steps begin to clearly appear. You are in a place now of increased vibration. You have been listening to a message yes, but more than that, you have been bathed in and surrounded in light frequency…. Know that now is a time of new beginnings. Remain focused on how you may provide service for others in a way that you will love, and trust that in this, the Universe will love and support you in all areas. Keep looking within for the voice and guidance of love… For from within you will receive profound guidance through your external world. And now, at this time we invite you to return your awareness once again into your physical body. Allow your energy to return to your body. Your focus to return to the present. You may want to move, stretch, wriggle your fingers or your toes, and allow yourself to return fully into your body, in this moment now. Know that you have been energetically lifted, and with light your energy and your beliefs have been cleansed. You are supported in creating Divinely guided and inspired new beginnings in your life, in harmony and deep resonance with the highest levels of love. Know that you may call upon me to assist you in any area. I am Archangel Metatron humbly at your service. Great!!!! Thank you melanie and AA Metraton through Melanie ..
Lovely meditation, thanks and many blessings, have begun channeled drawings recently and the first to come thru to be drawn was aa metatron…..then aa sandlyphon then aa michaul…..so very appropriate and in alignment with information i recieved aswell….love and light to all here of service now at this time..namaste. Thank you, I am forever greatful for the guidance you are sharing with the world. This was a very powerful meditation and I feel my spirit has connected with the divine spirit. Many blessings to you. im ascending and lately i have had blockage, lack of follow-through. your meditation helped me come back to center, not overthink, align and release a negative memory/belief ive overlooked, or should i say crept back in. the meditation was also a reminder that while acknowledging and the initial purging of this low vibrational thought is powerful, an “inventory” or “fully lit house cleaning” may help keep channels of intention clear. thank you. I’m having a hard time focusing on the whole purpose. I talk to the angels but maybe I don’t understand their guidance. Is there any other way I can directly connect? Thank you for a beautiful meditation! It helped. Thank you Melanie! this was very powerful and helpful for releasing 1 one of my unwanted beliefs. So much love and guidance you give. Thank you! Thank you Melony this meditation is beautiful I really needed it as i was feeling down. I just came across this today. All I can say is thank you!!!! I just broke up with my fella on Monday and am still feeling the effects of it, and this has helped me with feeling calmer and making me feel like I am worth it no matter what. It is helping me to step into and choose love rather than being negative etc. Thank you, thank you, thank you!! you are the best this relaxes me thank you. Thank you archangel metatron I am so inspired by your reading tonight. Yes I will be quite calm and still and look within and choose love. Yay! Brightest blessings of love and light to you!